For the subject of today's post, I drew the Sarcopterygii, the 'lobe-finned fishes'. Though something of a poor relation to their considerably more diverse sister-group, the ray-finned fishes of the Actinopterygii, this is a group most of my readers will have probably encountered in some capacity. As their names both formal and vernacular indicate, the Sarcopterygii were originally characterised by the development of the fins as fleshy lobes, with at least some fins possessing an internal skeleton of serial bones. Living sarcopterygians belong to three major groups, the coelacanths, lungfishes and tetrapods (in which, of course, the ancestral fins have been modified into walking limbs). 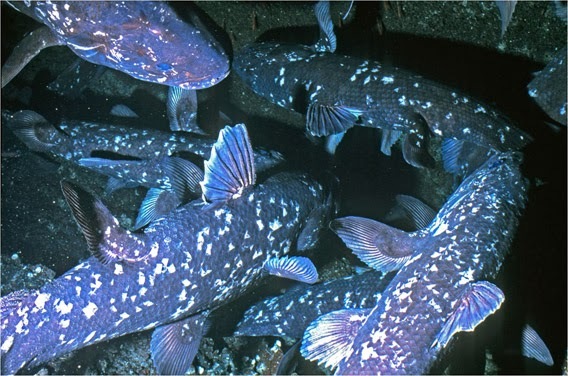 The majority of recent studies have placed the coelacanths as the most divergent of these groups, with lungfishes and tetrapods as sister taxa. As the tetrapods are a particularly tedious group of organisms, with little to interest the casual observer, I'll put them aside for this post (you can go to Tetrapod Zoology if you must). The lungfishes, too, warrant a more detailed look at another time. The oldest known sarcopterygian (and, indeed, the oldest known crown-group bony fish) is the Guiyu oneiros (shown above in a reconstruction by Brian Choo for Zhu et al. 2009), whose species name suggests the vernacular name of 'dream fish'. 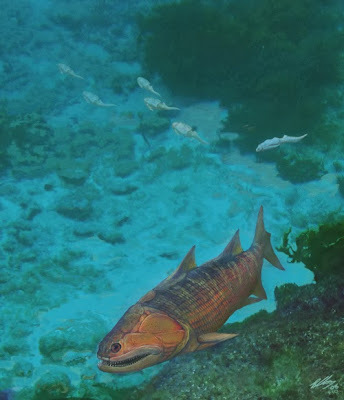 The dream-fish is known from the late Silurian of China, with a number of other stem-sarcopterygians such as Psarolepis and Meemannia known from the early Devonian of the same region. These taxa retained a number of ancestral features such as heavy ganoid scales (a type of scale also found in basal actinopterygians), and strong spines in front of the fins. However, crown-group sarcopterygians had also evolved and diverged by the early Devonian, as shown by the presence of the stem-lungfish Youngolepis. Congregation of West Indian Ocean coelacanths Latimeria chalumnae, photographed by Hans Fricke. The coelacanths are, of course, best known to most people for the discovery of the living Latimeria chalumnae in 1938 in South Africa, after the lineage had been thought to have become extinct in the Cretaceous. The subsequent media frenzy must have been interesting to fishermen in the area who had long known the coelacanth primarily as an infernal nuisance. Though only captured occasionally as bycatch, a landed coelacanth represents two metres or more of snap-jawed bad temper, while the oily flesh is inedible. More recently, a second species of living coelacanth, Latimeria menadoensis has been described from near Sulawesi in Indonesia. Though Latimeria may lord it over its immediate relatives, it is far from the largest sarcopterygian (even excluding the tetrapods). The tetrapod stem-group also included a number of large predators, including the famous Eusthenopteron (how many other fossil fish have been referred to by name in an episode of Doraemon?). Particularly dramatic were the Rhizodontida, freshwater ambush predators of the Devonian and Carboniferous. Though probably very low on the tetrapod stem (and hence not directly related to limbed tetrapods), rhizodontids developed enlarged pectoral fins that articulated with the body in a not dissimilar manner to tetrapod forelegs. Like tetrapods, rhizodontids probably used their pectoral fins to push against the substrate and provide explosive propulsion (Davis et al. 2004). The jaw of rhizodontids contained enlarged tusks interspersed among smaller teeth that would have hooked into struggling prey. The largest rhizodontids have been estimated to be about seven metres in length, and were the sort of predator that the term 'apex' was invented for. Reconstruction of Rhizodus by Mike Coates. Casane, D., & P. Laurenti. 2013. Why coelacanths are not 'living fossils'. BioEssays 35: 332-338. Davis, M. C., N. Shubin & E. B. Daeschler. 2004. A new specimen of Sauripterus taylori (Sarcopterygii, Osteichthyes) from the Famennian Catskill Formation of North America. Journal of Vertebrate Paleontology 24 (1): 26-40. Zhu, M., W. Zhao, L. Jia, J. Lu, T. Qiao & Q. Qu. 2009. The oldest articulated osteichthyan reveals mosaic gnathostome characters. Nature 458: 469-474. "[C]onsiderably more diverse" is putting it a bit strongly, isn't it? The Fount of All Knowledge says "almost 30,000" species of actinopterygians and "over 30,000" species of tetrapods. Great post. I saw a nice coelacanth talk at SVP the rekindled my interest in these dudes. It's interesting (to me at least) that coelacanths seem to have experienced a modest burst in diversity and disparity in the Early Triassic and were among the first "apex" aquatic predators to show up after the Permo-Triassic extinction. As far as apex predators go, Mawsonia and Megalocoelacanthus are worth mentioning, there is a 4.5 m length estimate for the latter genus based on a large but isolated coronoid (Dutel et al. 2012). There was also a suggestion in a meeting abstract that Megalocoelacanthus was planktivorous (Schwimmer 2009), which would be cool but I don' t think it has been published. @Andreas, IUCN numbers (here) also put both groups at close to ~31K described species, but it's almost certain that there are many, many more undescribed actinopterygians than sarcops/tetrapods. I've seen estimates for "fish" of 100k living species though I don't know how accurate that is (sounds high). I often trot out the "ray-finned fish are the most diverse group of living vertebrate !" line in classes, but it might be worth tempering that claim a bit. As the poor cousin comment was mostly just a dig, I'm not going to defend it too much. Though even without considering total species number, I think the balance of morphological diversity might be on the side of the actinopterygians. For instance, I'm not aware of any endoparasitic tetrapods.